We’ve written several times about the problems posed by watering a lawn as the heat increases and the summer wanes. 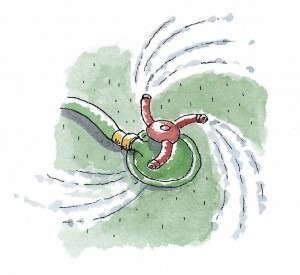 As we’ve noted before, frequent watering encourages grass to develop shallow roots – not the deep-reaching roots that help to create a healthy lawn capable of surviving drought, high heat and lots of activity. And too much water will keep the roots wet, making your lawn more susceptible to disease and insect damage. So take a tip from the Santa Clara Valley Water District, and cut back or eliminate watering your lawn for the rest of the summer. You’ll help conserve water, lower your bill, and help your lawn, too.